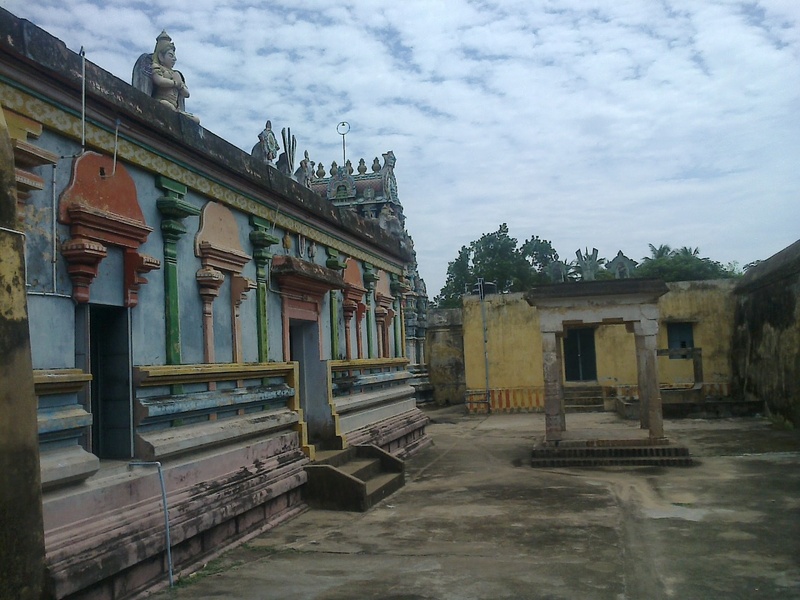 Sri Kolavilli Ramar temple is among the 108 divyadesams of Srivaishnavas. It comes under the choza naatu divyadesams. The thayar in the temple is known as Maragada valli temple. The lord is present in the reclining pose and the utsavar is known as Sringara sundaram. Markandeya Maharishi appears near the Lord’s head, Bhoomidevi at the foot, Brahma in the centre and the Lord’s feet are placed over Lotus. There are two prakarams in the temple. The temple is close to Senganoor/Chenganoor which is the birth place of Periyavachan Pillai. 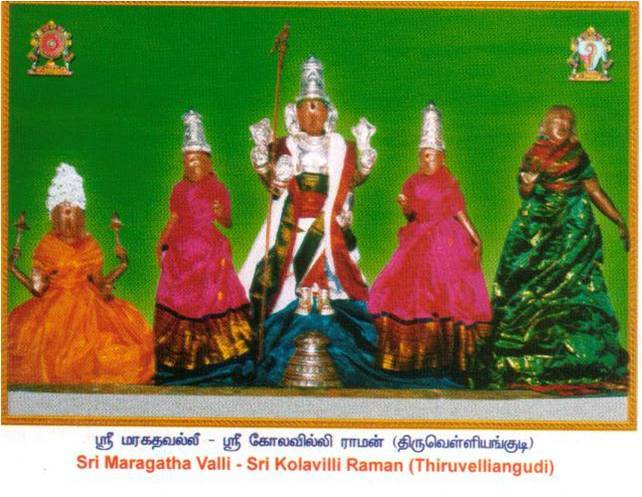 Located about 25 kms North East of Kumbakonam off the Madras road is the Kola Villi Raama Divya Desam in Thiru Velliyankudi. A small 10 feet road leads one along the 6 km path from Sholapuram to ThiruVelliyankudi with complete greenery and swirling breeze welcoming one all the way to the Divya Desam. Lord Perumal blesses the devotees in his Bhujanga Sayana-reclining form. The vimana above the sanctum sanctorum is of Varthaga Vimana design. Shukra, Lord Brahmma, Indira, Sage Parasurama, Mayan the divine sculptor had the darshan of Lord in this temple. Senganur, the birth place of eminent Vaishnavite Scholar Periavachan Pillai is near this place. Kanchi Acharya His Holiness Sri Chandra Sekharendra Saraswathi Swamigal - Kanchi Periavar – stayed here to execute renovations. The belief is that worshipping Perumal in this temple equals to worshipping Him in all 108 Divya Desa temples. Planet Shukra-Venus is worshipping Perumal in the form of a ever burning lamp as a token of his gratitude to Lord who restored his vision. Of the Navagraha importance places, this belongs to Shukra. A plantain that came through rocks still exists here yielding fruits once a year. This is the only Divya Desa temple where Garuda Bhagwan blesses devotees with four hands holding discus and conch (chakra and shanku). Lord Maha Vishnu, in His Vamana Avatar, sought three feet of land from emperor Mahabali. Shukra was the Guru of Mahabali. When Mahabali was to offer the three feet land to Vamana, knowing his design, Shukra took the form of a bee and blocked the handle hole of the water bowl to prevent Mahabali obliging Vamana’s wish. Vamana the Lord, removed the bee inside (shukra) with a grass stem to facilitate flow of the water to solemnize the charity. The stick hit one eye of Shukra. He lost vision of that eye. Shukra visited many places to regain the vision of the one eye, finally landed here, worshipped Perumal and got back his vision. Shukra is also called Velli. Hence, the name of the place Velliangudi. There is also a different story prompting Shukra to choose this place for his penance. Viswakarma, the celestial sculptor built a temple for Perumal. Seeing the beauty of the temple, Mayan, also a skilled sculptor but belonging to demon community felt that he could not do one for Perumal like this. He approached Lord Brahma to help him who suggested that he should perform penance on Lord Perumal in this place. Mayan performed penance here. Perumal granted him darshan but Mayan wished the Ramavatara darshan. Granting him the boon, Lord left His discus and conch with Garuda and granted darshan to Mayan as he wished. So Shukra-Velli chose this place of great glory for his penance to regain his vision. This is also a reason why the place was named Tiruvelliangudi. Saddened by the fact that Viswakarma, the sculptor of the Devas secured all the glory for the construction of the Divya Desams and that he was sidelined, Maayan, the Sculptor of the Asuras, undertook penance here at Thiru Velliyankudi. Pleased with his prayers, Lord Vishnu appeared before him and provided darshan in his full form with Conch and Chakra. 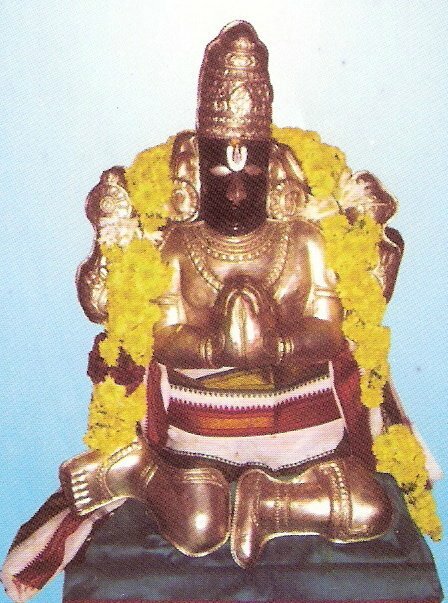 Of the 108 Divya Desas of Perumal, this is the only temple where Garuda Bhagwan appears with 4 hands holding discus and conch. Also this is the only place where plantain grows on a rock yielding fruits once a year even today. Lord Perumal graces in the temple in reclining form facing east and painted beautifully. It is said that praying at this temple would be equal to praying at all the 108 divyadesams. Lord Vishnu is present in the temple in the form of Lord Rama with a bow. The theerthams or pushkarni for the temples are Sukra, Brahma, Indra and Parasara theertham and the vimanam is known as Pushkalavartaka vimanam. Thiruvelliyangudi Sri Kola Valvilli Ramar temple is one of the 108 Divya Desams of Lord Vishnu situated in Thanjavur, Tamil Nadu. One of the great Vaishnavaite scholars Sri Periyavacchan Pillai was born in Shenganur a place close to Thiruvelliyangudi. It is believed that worship of Sri Kola Valvilli Rama in this sacred land would provide the devoutness equivalent to worship of Lord Vishnu in all the 108 Divya Desams. The temple is about 20 kms from Kumbakonam on the way to Aaduturai. The place is also known as Bhargavapuram. The nearest airport is Trichy and railway station is Kumbakonam. An auto to and fro from Kumbakonam to the temple costs about Rs. 250. Alternatively one can take a bus on the Annaikarai route, get down at Senganoor and take an auto from there. The best route is to reach Anaikarai road, take a right from Govilachery to reach Anakudi through Annai college. Take a left there and keep going straight across lush greenery to reach the temple. This temple remains open from 8.00AM to 12.00PM in the morning and 5.00PM to 7.00PM in the evenings. Thirumangalakudi (Via), Kumbakonam – 612102.